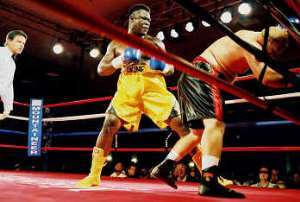 Accra, Dec 22, GNA - Ghanaian heavyweight boxer, Abraham Okine is making waves in the US with his power and ring-craft, making him one of the dreaded fighters in the elite division at the moment. Dubbed the "African Assassin" because of the brute force that has seen him stop eight opponents in two years, Abraham is now sitting on the International Boxing Council (IBC) Americas heavyweight throne after winning all 14 professional fights in the US. With victories over such notable boxers as Tony "TNT" Tubbs, former World Boxing Association (WBA) champion of the world who he stopped in the eighth round and Billy Douglas younger brother of Buster Douglas, former WBC champion of the world, Abraham has lifted himself into a credible contender in the heavyweight class. Narrating his exploits and supporting them with trophies, fight posters, newspaper cuttings and the IBC belt, Abraham who fights from his Pittsburgh base in the US said Hal Wrigley, his American manager had promised to match against Mike Tyson in May next year. The 32 year-old, six feet three inches tall Ghanaian said he would retire Tyson from boxing if their fight came on in order to compel matchmakers to get him a title shot before the end of 2005. The "African Assassin" has won eight of his 14 fights by way of knockout and he attributes it to the hard work he does under the tutelage of Wrigley who also doubles as his trainer and the inspirational words he constantly receives from Carmen Clottey, his local manager. He said the only difficulty he encountered was the unwillingness of boxers to fight him because of his size and power. "When they enquire about me and realise that I am a big guy with a lot of power, they turn their backs and refuse to sign contracts to fight against," Abraham said with an air of triumph splashing over his face. He said though he was drafted to spar with Vitali Klitschko before his world title fight against Danny Williams, the deal was abrogated for fear that he might injure the reigning world champion. The boxer said his victory over Tubbs surprised a lot of pundits and brought him closer to the doors of the big matchmakers and hoped a victory over Tyson too, would open all the big doors to fame, glory and big paydays. Currently in Accra on holidays after successfully defending his title via a second round technical knockout over Corey Gregory on November 24, Abraham said he was grateful to all those who helped in shaping his career from the amateur division in Ghana. He was particularly grateful to his local manager, Carmen Clottey and the technical team of the Black Bombers, the national amateur boxing team. The Ghanaian "Man Mountain' advised his colleague boxers who are resident in the country to take their training seriously, adding that Ghanaian boxers were of a special breed but the training facilities in the country negate their rapid development. Abraham said he would return to US in February next year with his wife because he would require her support and assistance to achieve his dream of becoming the undisputed heavyweight champion of the world.